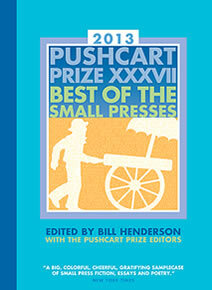 Each year, “The Pushcart Prize – Best of the Small Presses” is published to recognize writers whose short stories, poetry and essays have been sent out into the world that year. Writers who were first noticed in the series include Raymond Carver, Andre Dubus, Susan Minot and John Irving. For the first time, we’re nominating some of the works published in Deep South for the prize. We have to mail in up to six nominations by December 1, so please help us narrow down the Southern works that have appeared in our pages this past year by voting below. The six works that receive the most votes will be sent to Pushcart Press for consideration for the prize. UPDATE: The poll is now closed and the six winning works on their way to the post office. Click here to see the final results! Lovebug Seasons, a poem by John Davis Jr.
Midde of Nowhere is an excellent piece of work by a well received/published Southern author, Carol D. O’Dell. She’s as down home as sweet tea and this particular story is what Pushcart is all about. so what happens next?????? I want more! Lots of great poems here! Same Star, Different Houses by Wynne Huddleston is absolutely the best. Vote for Same Star, Different Houses. My vote is for Mississippi Speaks by Sandra Bounds.